Zari Hassan with Diamond Platinumz. South African based Ugandan socialite Zari Hassan has responded to the rumors going around about her re-uniting with her Tanzanian ex-husband Diamond Platinumz. Diamond Platinumz of late has been making regular visits to South Africa to spend quality time with his two children Princess Latiffa and Prince Nillan Dangote whom Zari mothers. However, Zari on her Instagram post, she explains that she has not re-united with Diamond , they just agreed to raise their children together. 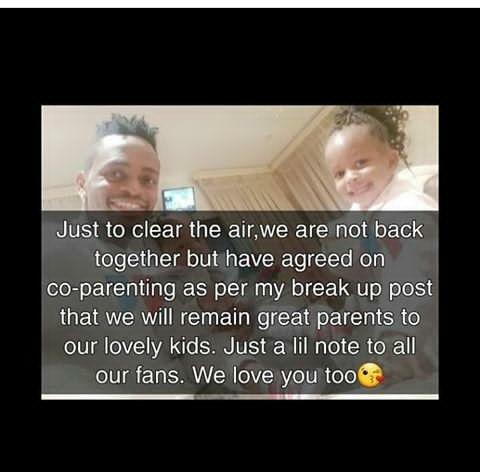 ‘’Just to clear the air we are not back together but we agreed on co-parenting as per my breakup post that we will remain great parents to our lovely kids. Just a little note to all our funs. We love you too,’’ wrote Zari Hassan.